Are you thinking about building a greenhouse? The easiest way to construct a greenhouse is to have a general contractor take on the task. Versed in greenhouse construction and other construction issues such as permitting and local building codes, a general contractor is able to easily navigate through the process making your build go smooth. 1. Freestanding or Attached? Will your new structure be attached to an existing building or freestanding? An attached greenhouse can offer the luxury of coming out of your home or office directly into the greenhouse during in climate weather. Plus, it can reduce construction costs due to the utilization of a preexisting wall. There are downsides to having an attached greenhouse built, such as unwanted humidity and the potential of introducing insects into your home more easily. Constructing a freestanding greenhouse has advantages and disadvantages. While it gives you a greater opportunity to create a completely new space with few restrictions, it also may be more expensive due to the need for new electric lines, water and other utilities being run to the building. Backup heat may be needed in some seasons and more building materials are needed due to not being able to use an existing wall as in the attached greenhouse scenario. 2. Orientation – In the United States, the best orientation to build a greenhouse is often facing directly south or southeast to capture the early morning sun, especially in colder seasons. An east-facing structure can work in some instances; however, a west-facing orientation should be avoided because of the potential to overheat. 3. Materials – Two of the most common framing materials used when building a greenhouse are metal and wood. For a smaller greenhouse, wood is an excellent choice because it is cheaper, easier to work with without the need for special tools. Wood however requires more upkeep. Most commercial greenhouses are constructed using galvanized steel, which has a longer life span than wood and does not requite much maintenance such as staining or sealing. 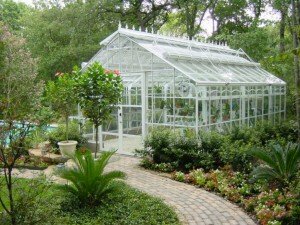 Whether you want to build a greenhouse for your home and personal use or construct a multi-acre greenhouse complex, AFSGC has the credentials, the skills and the experience to manage your project through all phases of permitting and construction. Our company utilizes the highest quality materials and expert craftsmanship. For a free quote, please feel free to contact us for your custom agricultural project.